East Coast Dune Buggies - Is That a Kit? Submitted by Gary Holbrook, January 24, 2011. Edited on February 5, 2011 to help further clarify the distinction between a complete "kit car" and a "kit car body". I have been approached with this question on more than one occasion; at car shows, cruise ins, places to eat, and even at the gas station. The question itself does make perfect sense to the one that is inquiring for a quick answer, but those within the fiberglass dune buggy community know full well that the answer is not quite so easy. "Hey, those dune buggies are cool. It's been years since I've seen one. Did you buy it, or make it yourself? Is that a kit? If so, where can I get one? The simple answer is "No, this is not a kit," but in a way that is too simple of an answer. There are certain companies (Meyers Manx, for example) that do offer body kits, but they do not include the pan/chassis, engine, interior, tires, wheels, etc; you'll need to make arrangements to secure a "donor" vehicle on your own. Then, there are other companies (Mendeola, for example) that sell turnkey dune buggy builds, where they handle the complete construction process from start to finish, depending on your specifications. Some clarification may be called for here. To me, the actual term "kit car" may infer (at least to the uneducated public) that the "kit" that is being considered for purchase includes all of the components to build the complete car, kind of like a car in a box. However, the term "kit car" has also morphed into also referring to kit car body packages where, once again, a donor vehicle is needed for some of the basic parts (chassis, suspension, other required parts). In fact, there are many times where the actual donor chassis has to be modified (possibly shortened) to even fit the kit car body iself. A true, by-the-book example of a complete "kit car" may be found in the case of the reproduction Cobras; I have come across websites that do offer the complete "car in a box" option, so to speak. I decided to look back on the MS Excel spreadsheet that I created early on in my build; a guideline that I used to help list my past, present and future purchases. Columns included the name of the part, cost, part number, where purchased, and one that provided space for a few details when the situation called for it. As the item arrived at my doorstep, I would change the black text in each line to gray, as a way keep up with my inventory (and how much cash was being funneled away from my checking account). As a side note, I also created a Word document to help track my build progress, by trying my best to predict what future tasks would or might need to be addressed in the near or distant future. I would also gray out the text on each line once that particular task was complete. There were also times to where I would take a line item and break it up into sub-items in order to give myself a more-detailed snapshot, and to also make sure that I had the proper parts in my possession beforehand. It was very tempting to "over-order" the parts that I believe I needed, just to convince myself that I was making actual progress in my build. Most of us know that is not a good idea, mainly because there are times to where a build may take a different direction than the one that was planned from the beginning (which also means that extra, unused parts and pieces may lie around forever). I knew (or should I say "hoped") that, at the time, I was going to be able to afford my build, but I did not have a bulk amount of $$$ that would allow me to buy everything at once. Looking back, that was a very good thing; I tried to disipline myself to order just what I either needed at the time, or what would be needed on the next upcoming tasks. For those that still may believe that these fiberglass dune buggies come in a type of kit format, check out a sampling of items that were included in my dune buggy build (prices paid for each product is not included). This by no means is the complete list. It also does not factor in connectors, couplers, switches, fuses, tools, paint, lube, bolts/nuts/washers, bearings, bushings, mounts, cables, shortening kits, cleaners, powdercoating, and the countless local trips to Lowes, Home Depot, West Marine, Best Buy, Auto Zone, Advance Auto, and NAPA Auto Parts. Just Vee Dubs - new 1776cc VW engine with ceramic off-road exhaust, stainless steel muffler, rear axles (ordering from this company was a HUGE mistake. Not only did I have to contact local law enforcement to get them to stop by the business in order to follow up on my grossly-overdue order ("Oh yeah, we know that guy"), but the engine soon developed an oil leak behind the crank pulley; the case had cracked because of a small piece of metal that was sandwiched in between the 2 halves upon assembly. To add frustration to my decision, the transaxle that I sent them for rebuild also crapped out on me a few months after the build was completed; I had to remove the transaxle and send it to Rancho Performance to get it rebuilt again CORRECTLY and in a timely manner). Salvage parts from various VW Beetle graveyards - complete IRS rear end from the torsion bar back, transaxle, ball joint front end, steering box, steering column, various electrical parts. Rancho Performance - transaxle rebuilt for the second time, see above. Introduction - What is a Dune Buggy? Why Air Cooled VWs and Dune Buggies? Hey, Is That a Kit? Where Can I Buy One? Hey, Is That A Kit? If So, Where Can I Get One? ECDB Reader's Rides Gallery - Submit Your Photo! East Coast Dune Buggies/eastcoastdunebuggies.com is in no way representing or affiliated with Volkswagen of America, or Volkswagen of Germany. Volkswagen, VW, and the VW logo are Trademarks of and owned by Volkswagen of America and Volkswagen AG. 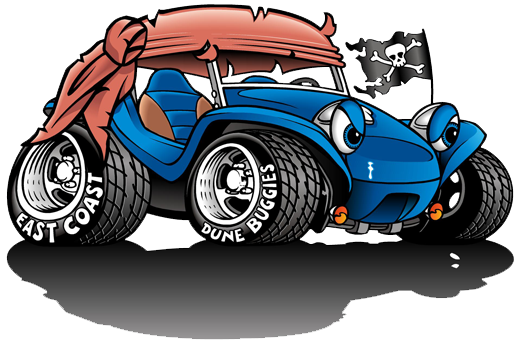 Copyright © 2012, 2013, 2014, 2015, 2016, 2017, 2018 East Coast Dune Buggies/eastcoastdunebuggies.com. Website created and maintained by Gary Holbrook. Any unauthorized use of the materials or logos/images on this site is stictly forbidden.